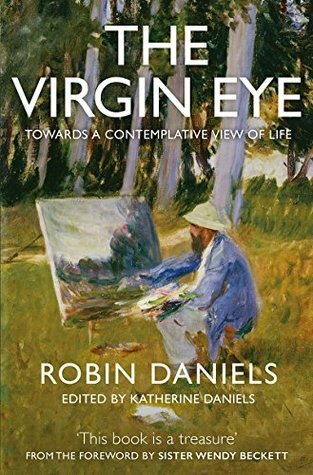 The Virgin Eye by Robin Daniels is a marathon of a read, not because it is overly long but because you need to pace yourself and attend to the beautiful scenery and profound insights along the way. Rush and you might miss something. The style of writing took me back to an earlier time, when people communicated in long, elegant, well-considered sentences rather than the easy fix bullet points of so many self-help books today.I thoroughly enjoyed the multitudinous literary and Biblical references in the book. I felt stretched both intellectually, spiritually and psychologically as I realised how far my hectic lifestyle and bite-sized spirituality is from the contemplative enjoyment of God that Robin practised. I found my heart beat slowing down as I read. Peace descended upon me as I considered each pearl of wisdom. This book is so rich that it requires another reading, preferably in paperback form. Reading it on a kindle, as I did, meant I was unable to flick back and forth as I would have liked to enjoy again the quotes and insights. My only caveat is that much as I yearn for the tranquillity of the contemplative life glimpsed at in this book, motherhood brings with it demands and tensions not experienced by Robin and resting places are few and far between. I received a free copy of this book on the understanding that I would give an honest review. This is a book to be savoured and not rushed as it is packed with treasure. Every page is brimming with insight. Although I read it as a whole it is a book that can be dipped into and read in bite sized chunks. I know I will be constantly revisiting it to read its words of wisdom. The Virgin Eye encourages us to view the created world with God's eyes and as if we were seeing things for the very first time. The contemplative sees the world as God sees the world and on reading and reflection this book helps us to open our hearts and minds to God. This book feels like a life's work and the author generously shares his expert knowledge of psychology with his life experiences and combines them beautifully with scripture, poetry and helpful passages from other renowned spiritual writers. I have never underlined a book so much! This is a book about silence and solitude, longing and loving and revelation and realisation. I cannot recommended this book highly enough. I received a free copy of this book from Instant Apostle in exchange for an honest review all opinions expressed here are my own. This is a book that takes you deeply into calm spirituality. It is from a Christian perspective but there is much in it for others. I read it cover to cover but I will keep it close as a resource to use to aid contemplation, understand rationale and provide practical support. To sun up it provided me with more determination to 'love God and love my neighbour' as the ultimate guide to living. This was a great book! I borrowed it from the library, but would like more time to digest it. I may just buy one for my own. It is a work of art, to be viewed again and again. It's hard to know where to begin when reviewing this deep, emotive and thought provoking work. This made me take a step back and look at myself, my journey through life, the things that hold me back and those that fire me forward! It was full of golden nuggets and I have highlighted so many to look at, mull over and meditate on over time and this is the one thing you do need with this book - time! This is not a quick read because there's so much substance to it and so much of it spoke into my heart and reminded me of the importance of 'letting go and letting God' and any book that can have that effect comes highly recommended by me. Instant Apostles sent me a free copy of this book for an honest review and opinions expressed here are my own. Robin Daniels' book provides the reader with hope at a time when long-standing virtues in our culture seem to be absent. Providing an analysis of contemporary challenges such as the speed of change, the resultant increase in stress across age groups including childhood, adolescence and those in the work force, I felt like I was reaping the wisdom of the author's many years as a psychoanalyst with Jungian background and faith in human kind.I loved his poetic references and global insights which intellectually and playfully invite the reader to see problems from a wider perspective. I purchased ten copies and gave them to family and friends. The book invites the reader to mindfullness, to contemplation, to celebration, to appreciation. I would recommend it to anyone searching for balance in these crazy times.